← Cheap Apple iPhone without a contract? Internet faxing allows you to send and receive faxes from your email. Axiatel automatically provides you with a fax number during registration. Your contacts can send you faxes to your new number, like a traditional fax, the only difference is that you receive them directly on the computer. As a result, it is also possible to send documents directly from your computer, or a Smartphone. With this service, the user no longer needs to print the documents you send or receive, and does not require the purchase of any appliances. All rates include the unlimited reception of faxes. It is only the reception pack that does not include the sending of faxes, so each time you send a fax will have to pay 9c per page. The remaining packs include sending 100, 300 and 1000 pages per month. 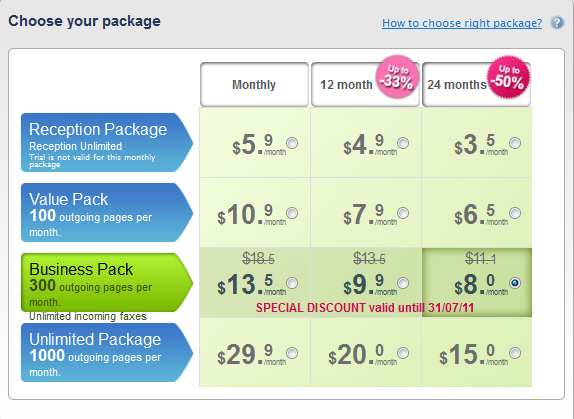 If you choose to subscribe to a pack for 12 month you can save 33% on the price of the annual pack, while if you subscribe for 24 months, you have save 50% on the pack. The Value, Business and Unlimited packs all offer a 30 day free trial. This trial allows you to test the service without having to pay a cent. For more information jump on to the website http://www.axiatel.com. This entry was posted in Fax to email and tagged Australia, Fax, Internet fax, Online fax, Services, Telephone number. Bookmark the permalink.